The soup is on. As the fall and winter months progress, who doesn’t love a simple and tasty soup recipe? This particular tomato soup has a pesto “twist” that I know you will love. Personally, I am not much of a tomato soup fan, mostly because my memories are predominantly of canned tomato soup. Kerri’s Tomato Soup is the exception for me. I encourage you to open your mind about tomato soup and give this one a try, as well. I just love this tomato soup and I know you will, too. The addition of Swiss chard or spinach pesto is what makes this soup so unusual and hearty. And the coconut cream brings a delightful dairy-free creaminess. You can use fresh tomatoes, as I did, or try canned tomatoes to make things even faster and simpler. Either way, buy organic when possible. Who doesn’t love a simple and tasty soup recipe? 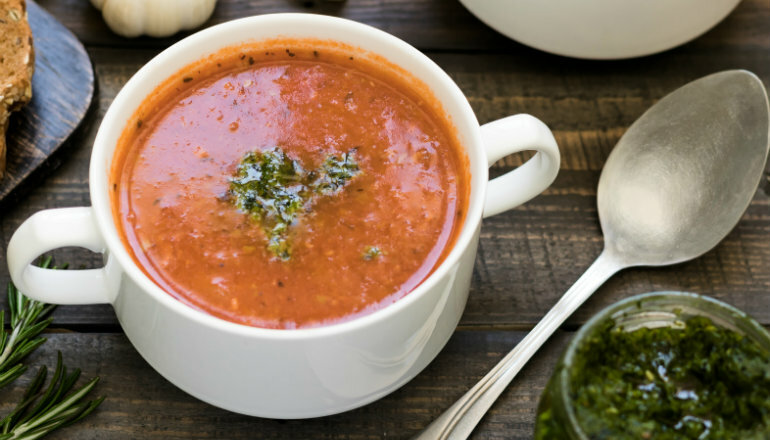 This particular tomato soup has a pesto “twist” that I know you will love. Saute onions for 3-5 minutes or until they start to soften and turn translucent. Stir in garlic and cook another minute. Add chopped or canned tomatoes, pesto, bay leaves, thyme, salt, and pepper. Remove bay leaves and puree using an immersion blender or cool and use regular blender. Stir in coconut cream and reheat as needed, serve hot. Add garnishes to each bowl, if desired, and enjoy. A fresh, dairy-free pesto can brighten so many different meals. Pulse spinach in food processor. Add nuts and garlic to food processor. Add remaining ingredients except oil and process until thoroughly chopped and mixed. With processor running, pour oil slowly down the side of the processor opening and process until mixed. This non-traditional pesto is still guaranteed to please your taste buds (and your dinner guests). Chop Swiss chard and add to food processor. Add remaining ingredients except olive oil. Process until ingredients are finely chopped. With the processor running, slowly pour olive oil down the side of processor opening. Blend thoroughly. Food and feeding people have been Sandy’s passion for many years. Her mother was a grand cook, yet didn’t often share her knowledge or techniques, so Sandy learned through osmosis. She then moved on to healthy cooking and feeding the many children in her family: birth daughters, adopted daughter, stepchildren, and foster children. Her focus has always been clean eating and healthy foods although the actual foods have changed over the years. While never slowing in her passion to create by making real food, healthy personal care, and cleaning products, she also experienced being the food editor for a print and online publication called WNC Woman based in western North Carolina.